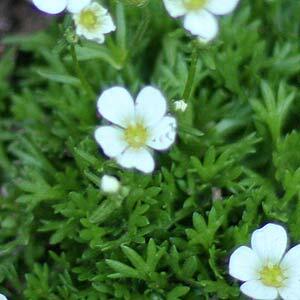 Sold as ground cover plants Saxifraga are low growing and come in a number of useful varieties for landscaping. Growing well in full sun to part shade many species and cultivars have good flowers, while others are grown for the luxurious foliage. Saxifraga species including Saxifraga stolonifera commonly called ‘Mother of Thousands’, make great drought tolerant ground cover plants. However it is the Alpine Saxifragas that reach around 15 cm in height and will slowly spread to cover .5m that are more widely sold by wholesale growers. These form an attractive mound of mid green foliage and in spring have pink, red or white flowers for a number of months. Generally flowering from spring to mid summer and with a very uniform growth habit Saxifraga are also suited for growing in containers. S. caespitosa – Low growing with fine green foliage, flowers generally white to pink. S.poluangelica – Low growing with Pink to Red flowers. Sa. x apiculata – Low growing with white to yellow flowers. S. x arendsii (Alpino) – Attractive mound forming variety, evergreen foliage flowers are pink to red with some white varieties, also known as ‘Rockfoil’.